Paul Krugman writes today about the incoherence of the Blue Dog position on healthcare reform: they say they want it to be fiscally neutral, but they relentlessly oppose every effort to actually make it revenue neutral. Does this mean they’re just corporate shills? I guess I’m not quite that cynical. After all, today’s Blue Dogs are politicians who didn’t go the Tauzin route — they didn’t switch parties even when the G.O.P. seemed to hold all the cards and pundits were declaring the Republican majority permanent. So these are Democrats who, despite their relative conservatism, have shown some commitment to their party and its values. I’ll bet he was gritting his teeth when he typed that. 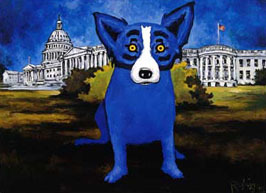 My attitude toward the Blue Dogs is a wee bit less charitable than that at the moment, and when he’s not writing for public consumption I’ll bet Krugman’s is too. The Dogs may be centrists, but someone needs to remind them that they’re still supposed to be centrist Democrats. It’s time to fish or cut bait.